for Sunday School or even just a movie night with my own little chickies! 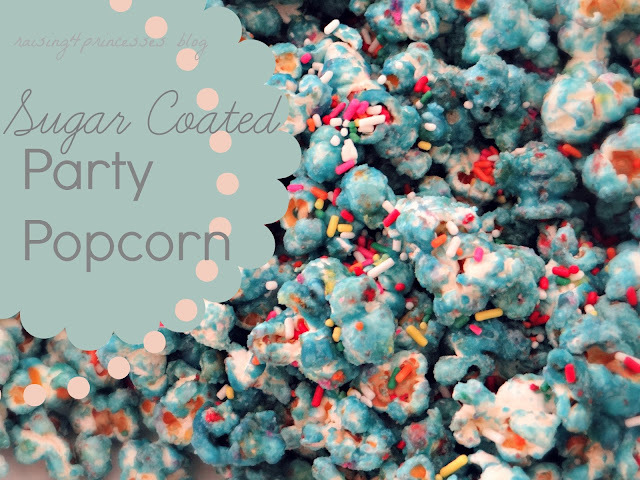 candy popcorn looks pretty and is loved by all ages! 3. remove from heat and stir in a vanilla and food coloring. 4. pour hot mixture over popcorn. cover with tight lid and shake it up. shake, shake, shake. I sometimes add colorful sprinkles when I spread it to cool. It doesn't stick perfectly but it is still pretty. This would be a great snack that I can make for the teen girls! Thanks for sharing!